"On the advice of Lotte Schöne , Christiane Castelli joined the National Conservatory of Paris in 1942 where she studied with Claire Croiza and Roger Bourdin. In 1944 she won 1st prize. 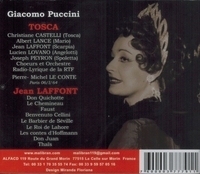 She debuted at the Opéra-Comique 16 March, 1946 in LA TRAVIATA, then at the Palais Garnier 18 June, 1952 in the role of Hebe in Rameau's LES INDES GALANTES. 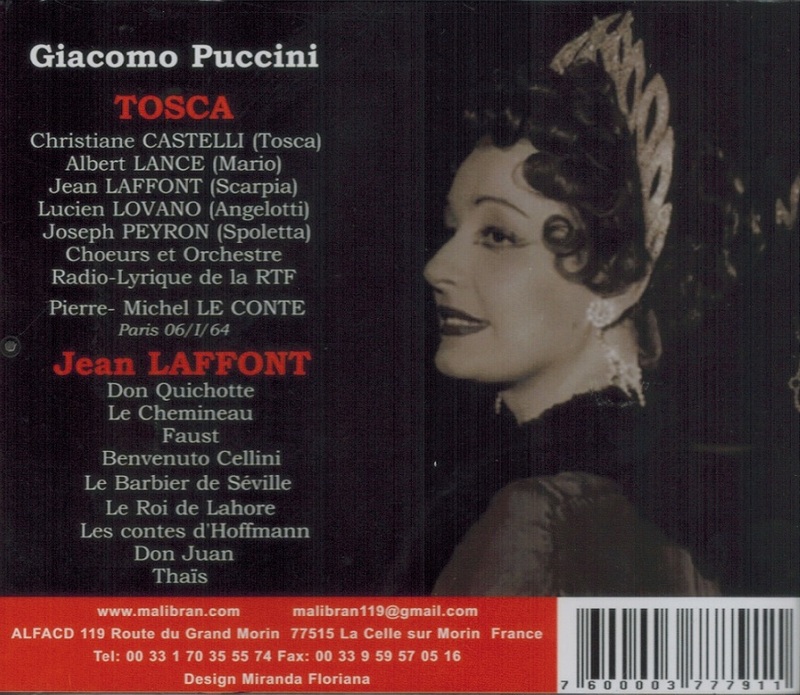 She then sang Desdemona in OTELLO, Rozenn in LE ROI D'YS, Marie-Louise in L'AIGLON (1952), 1st Lady in THE MAGIC FLUTE (1954), Marguerite in FAUST (1957), Violetta in LA TRAVIATA (1959 ), Tosca [which she sang over 300 times] (1960), Amelia in UN BALLO IN MASCHERA , Elisabeth in DON CARLOS, etc. Her farewell performance was in recital at the Paris OpÃ©ra in 1977. Jean-Philippe Lafont is a French baritone who made his operatic debut as Papageno in THE MAGIC FLUTE at the Salle Favart, Paris in 1974. He went on to appear regularly in Toulouse, where he first sang the title role in Verdi's FALSTAFF in 1987. Lafont has performed at the Opéra-Comique in Paris, Carnegie Hall and the Metropolitan Opera, La Scala and the Royal Opera House, London. Among the roles with which he is particularly associated are the four villains in THE TALES OF HOFFMANN, the Comte des Grieux in MANON, Golaud in PELLEAS ET MELISANDE, Barak in DIE FRAU OHNE SCHATTEN and the title roles in GIANNI SCHICCHI, RIGOLETTO, BORIS GODUNOV and MACBETH." “Albert Lance was an Australian tenor who also enjoyed French citizenship. He was Australia's principal tenor during the 1950s and later enjoyed a highly successful career in France. He was born in Menindee, South Australia as Lancelot Albert Ingram, but was usually known as Lance Ingram. After an audition at the Melbourne Opera, he was immediately offered a contract. He made his début there, as Cavaradossi in TOSCA, in 1950, and went on to sing Rodolfo in LA BOHÈME, and Pinkerton in MADAMA BUTTERFLY, to considerable acclaim. Having changed his professional name from Lance Ingram to Albert Lance, he made his Paris début at the Opéra-Comique in 1955, as Cavaradossi. The following year, he made his début at the Palais Garnier, in the title role in FAUST, and the success was immediate. He quickly established himself as one of the leading ‘French' tenors of the time, at both the Opéra-Comique and the Opéra until 1972, singing the great French roles such as Roméo, des Grieux in MANON, Werther, Don José, etc. He was also invited to perform at the opera houses of Lyon, Bordeaux, and Marseille, as well as London, Vienna, Moscow, Leningrad, and Buenos Aires. 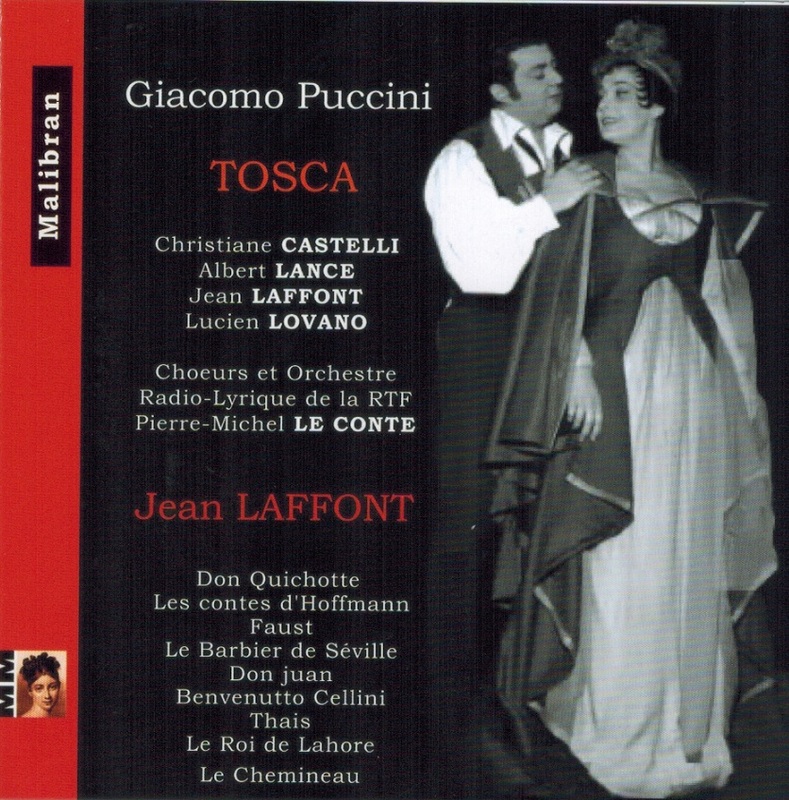 Lance was also much appreciated in the Italian repertory, adding to his repertory the lead tenor roles in RIGOLETTO, LA TRAVIATA, CAVALLERIA RUSTICANA, PAGLIACCI and others. Lance made his American début at the San Francisco Opera in 1961, in the creation of Norman Dello Joio's BLOOD MOON. He also appeared in Los Angeles and Philadelphia. Lance became a permanent member of the Opéra national du Rhin in Strasbourg from 1973 until his retirement in 1977. After his retirement from the stage, Lance turned to full-time teaching, first at the Music Conservatory of Nice, and later Antibes. Lance became a French citizen in 1967. Lance left a few recordings, notably a complete WERTHER made in 1964, with Rita Gorr, Mady Mesplé, Gabriel Bacquier, conducted by Jésus Etcheverry. There is also a complete MADAMA BUTTERFLY (in French) from the Opéra Comique de Paris conducted Albert Wolff from 1957 with Lance as Pinkerton, and scenes from HÉRODIADE conducted by Georges Prêtre from 1963 with Lance as Jean alongside the Salomé of Régine Crespin and Hérodiade of Rita Gorr.